Bacalao - salt cod - is one of the great Spanish delights, adding flavor to bland ingredients such as potatoes. If you are unfamiliar with it, then this is a delightful way to try it out. 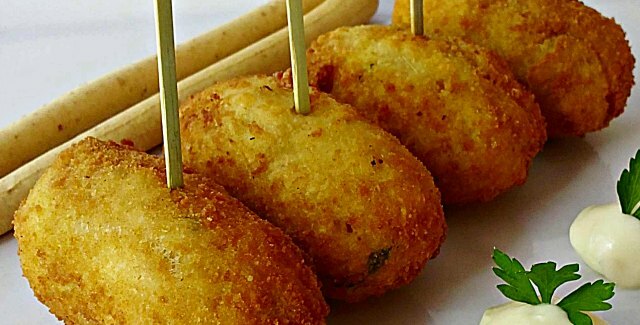 Bite size fish cakes, dipped into rich, creamy, garlicky allioli, are irresistible as a tapas dish or appetizer. Soak the salt cod in cold water for at least 24 hours, changing the water two or three times. The cod should swell as it rehydrates. Sample a tiny piece. It should not taste unpleasantly salty when fully rehydrated. Drain well and pat dry with kitchen paper. Cook the potatoes, unpeeled, in a pan of lightly salted boiling water for about 20 minutes, until tender. Drain. As soon as they are cool enough to handle, peel the potatoes, then mash with a fork or use a potato masher. Pour the milk into a pan, add half the spring onions and bring to a simmer. Add the soaked cod and poach very gently for 10-15 minutes, or until it flakes easily. Remove the cod and flake it with a fork into a bowl, discarding bones and skin. Add 4 tablespoons of mashed potato to the cod and beat them together with a wooden spoon. Work in the olive oil, then gradually add the remaining mashed potato. Beat in the remaining spring onions and the parsley. Season with lemon juice and pepper to taste - the mixture may also need a little salt but taste it before adding any. Add one egg to the mixture and beat it until thoroughly combined, then chill until firm. Shape the chilled fish mixture into 12-18 balls, then gently flatten into small round cakes. Coat each one in flour, then dip in the remaining beaten egg and coat with dried breadcrumbs. Chill until ready to fry. Meanwhile, make the allioli. Place the garlic and a good pinch of salt in a mortar and pound to a paste with a pestle. Using a small whisk or a wooden spoon, gradually work in the egg yolks. Beat in about half the olive oil, a drop at a time. When the sauce is as thick as soft butter, beat in 1-2 tablespoons lemon juice. Continue adding oil until the allioli is very thick. Season to taste, adding more lemon juice if you wish. Heat about 3/4 inch oil in a large, heavy frying pan. Add the fritters and cook over a medium-high heat for about 4 minutes. Turn them over and cook for a further 4 minutes on the other side, until crisp and golden. Drain on kitchen paper, then serve with the allioli, lemon wedges and salad leaves.